Outside the courthouse Friday. Photo by Millie. Thanks Millie! I spent much of the last week producing stories about the Fulton County grand jury’s pending indictment of Atlanta Public Schools employees connected with the cheating scandal. It was exhilarating, maddening and — like most stakeouts– unproductive most of the time. I came away with many questions that I can’t really properly answer. Was a daily drumbeat of coverage really necessary? Once you report that the grand jury is considering indictments, is it necessary to stake out the lobby of the district attorney’s office for three straight days to see who walks by? Enterprise stories on the scandal are always a good thing; done in conjunction with the grand jury activity, such stories are timely. But the stakeout — of a secret proceeding, wherein most of the players are whisked in and out via secure and unseen entrances and exits — gives the audience the appearance of covering news, rather than actually covering it. In the DA’s lobby. Luis, the WSB photog, shot pool for all the Atlanta stations. 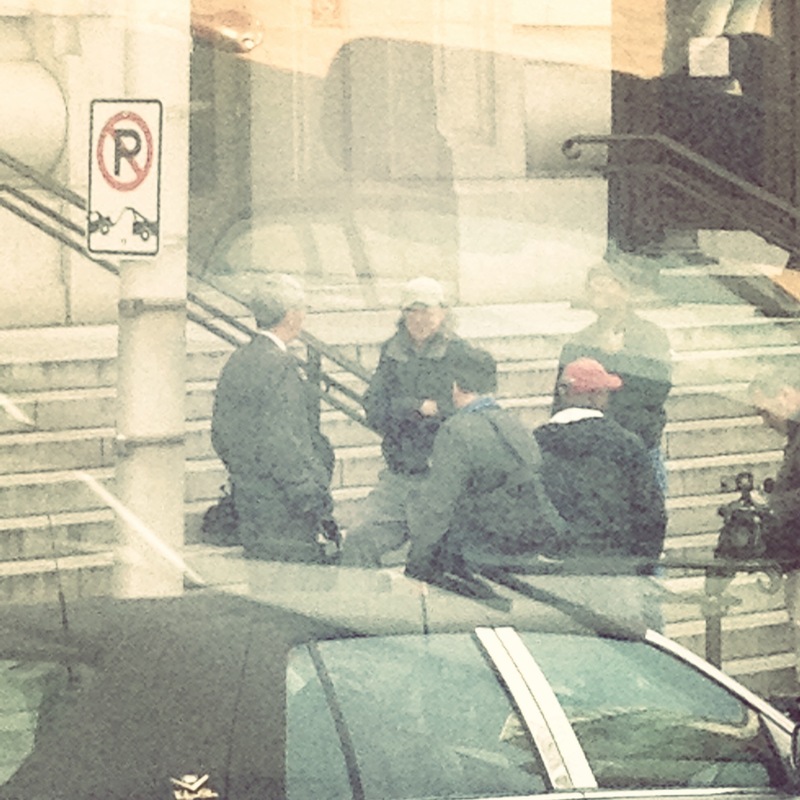 Does it really take nine reporters to cover the details of an indictment? WSB tweeted its staffing Friday afternoon. WXIA had an even larger proportion of its staff covering the story. It was great fun to see everybody, by the way. But really. Really? Isn’t it time somebody called WSB on its frequent assertions that it breaks certain stories when they are, in fact, broken elsewhere? 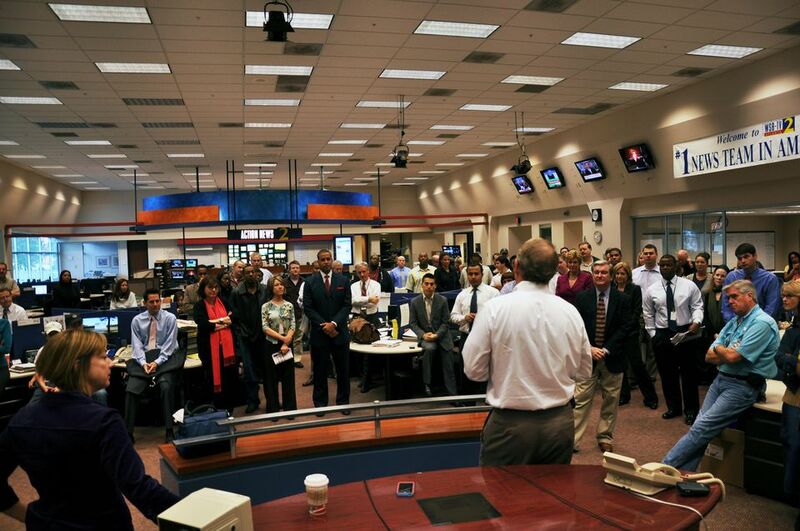 “All the stations do it,” suggested a WSB employee, as the topic arose during the tedium of the three-day stakeout. Maybe, but WSB is easily the market leader in casually assuming, incorrectly, that they’ve broken a story. Must there be so much social media? If you follow commercial news media folk, you can expect your Twitter feed to be clogged with trivialities– though every now and then, you may actually learn something. 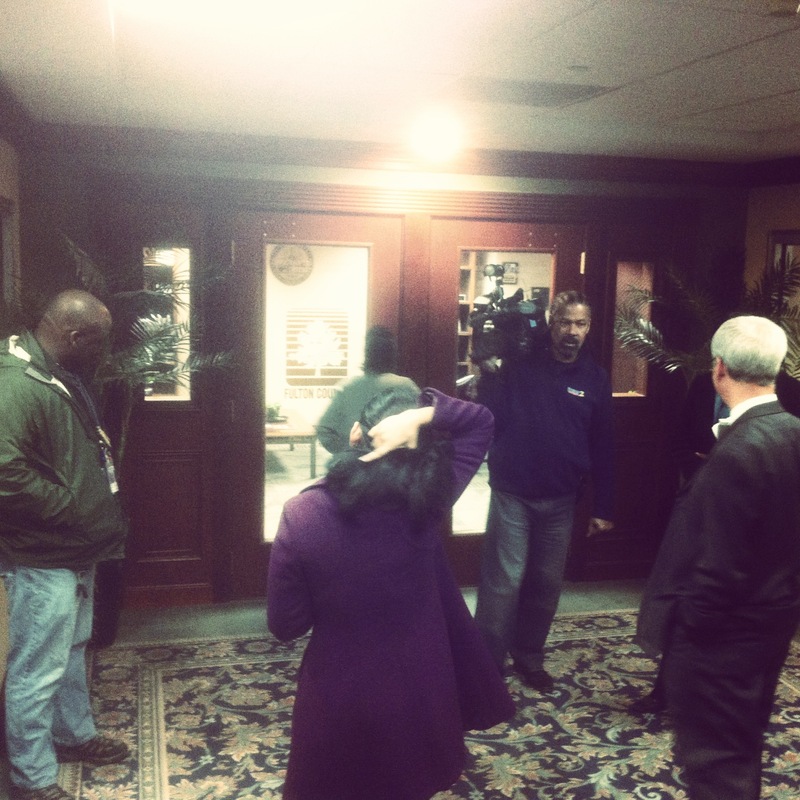 Is a court order really necessary just to get a TV camera into the Fulton County courthouse? To shoot pictures in the DA’s lobby? To shoot a news conference? 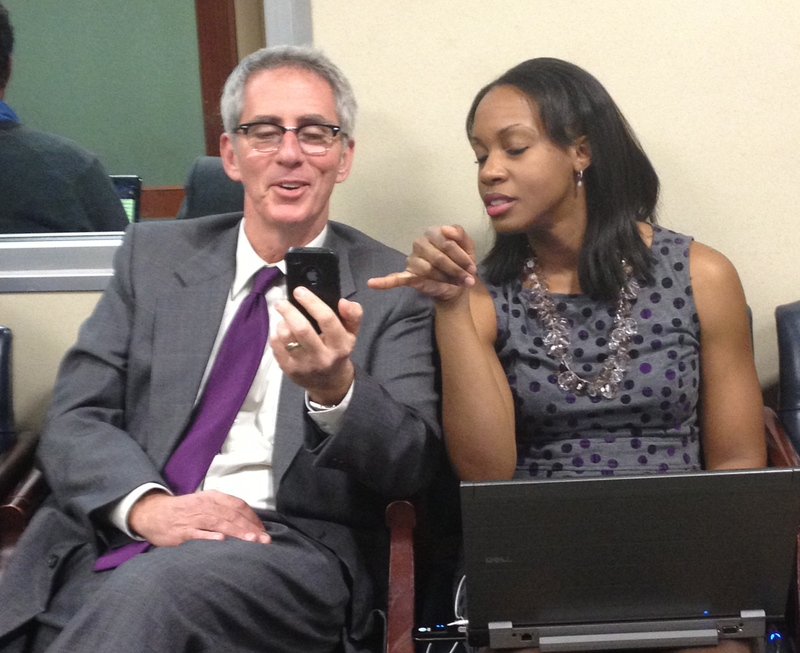 Obviously, a court may issue an order on a courtroom camera providing pool coverage of court proceedings. But it’s ridiculous that the sheriff has instructed courthouse deputies to bar cameras in this public building without a court order. What about Brian Nichols? I hear you asking. Nichols, a criminal defendant, shot and killed three employees in the Fulton County courthouse. Perhaps the sheriff has ramped up security surrounding defendants in custody. One certainly hopes so. But the metal detector security at the main entrances is exactly the same as it was pre-Nichols. The only noticeable procedural difference in security, to me, is the hard line taken against TV cameras. Which seems to me not one bit related to any real security issue at this courthouse. If you’ve known for days that you were planning to ask a grand jury to make high-profile indictments, wouldn’t you have a plan in place to actually announce the indictments to the news media? And wouldn’t you share that plan, as a professional courtesy, just so that the media can handle deadline logistics? In other words: If you’re a big time DA’s office, why is the answer “I don’t know” to three days worth of questions about how the completed indictment will actually be disseminated? And why are the photogs covering the newser told to move, in thirty minutes time, from the third floor, to the seventh floor, then back to the third floor, then back to the seventh floor? Lastly: Is there any question now that grand juries are merely rubber stamps to the desires of prosecutors? 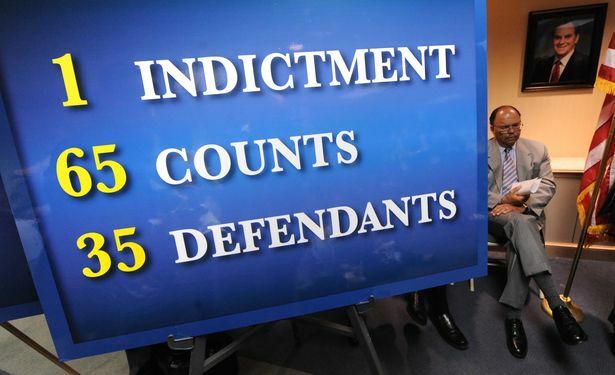 How far in advance of the grand jury’s blessing did the DA have two giant graphics produced for the news conference — one of which read “one indictment, 65 counts, 35 defendants”? These are my questions. Thank you. This entry was posted in WSB, WXIA on March 31, 2013 by live apt fire. It’s Fulton County, which can boast of the most dysfunctional justice infrastructure in the state. Ask anyone in the legal profession (other than employees of the FulCo justice bureaucracy) who has to conduct business there – they will verify. At least in the day Louis Slaton had lights rigged in his office for interviews and occasionally was interested in talking to the media. And a current DA who rounded a few of us up today, only to tell us how he’d like his announcement on 04.02 to be portrayed. Seriously? No cameras without a court order? That is newsworthy by itself.